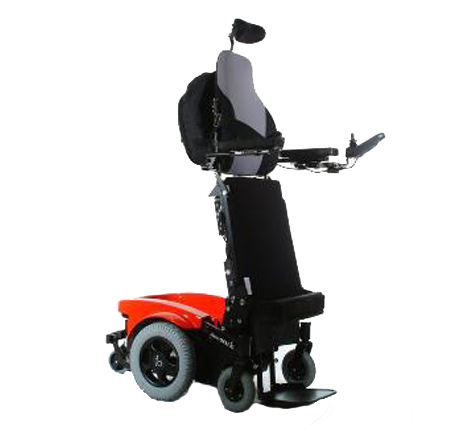 The LEVO Combi Jr., like its big brother, is the world’s ultimate precision engineered full power standing wheelchairs providing the widest range of electric powered wheelchair positions. However, the LEVO Combi Jr.is designed and sized to fit the special needs of your child. Like the adult version, the LEVO Combi Jr.has multiple seating, tilt, recline and standing capabilities. The LEVO Combi Jr. maximizes your child’s participation in daily opportunities and activities. Be it at school or home or play. Easy adjustable growth plates, components and a wide range of children’s accessories allow the LEVO Combi Jr. to grow with your child for many years. For more information, please visit www.levousa.com.